Did you ever eat vanilla wafers as a kid? You know I did. They were a favorite in our house, especially for snacking, dipping in milk, and layering in things like banana cream pie and pudding. Mmm, pudding. As you might’ve guessed, I’ve recreated this childhood classic with real, whole food ingredients so they’re now vegan and gluten-free! Let’s do this! This 9-ingredient recipe starts with a mix of organic cane sugar (or coconut sugar), coconut oil, and a hefty pour of vanilla. I relied on aquafaba for an egg replacer that is colorless, helps bind, and also contributes to a little rise when baking. For flours, I went with a mix of almond flour, guten-free flour blend, and cornstarch (or arrowroot starch). This keeps the cookies light and provides a slight crunch. Once you roll out your dough, simply cut into tiny circles (35 to be exact) and bake until crisp and slightly golden brown. These vanilla wafers would make an easy sweet treat to have around the house when cravings hit or to crumble into things like banana cream pie filling and even banana blizzards! I could even see these working well blitzed up and mixed with a little coconut oil as a pie crust. 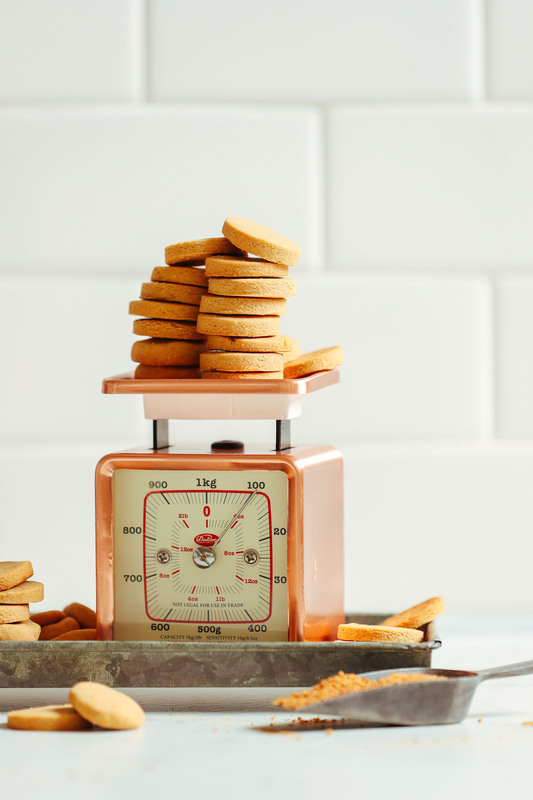 If you’re into cookies, also be sure to check out our Fluffy Vegan GF Sugar Cookies, Fudgy Vegan Brownie Cookies, Healthy Oatmeal Chocolate Chip Cookies, Almond Butter Chocolate Chip Cookies, and Peanut Butter Cup Cookies. If you try this recipe, let us know! Leave a comment, rate it, and don’t forget to tag a photo #minimalistbaker on Instagram. Happy baking, friends! Easy-to-make, fluffy vegan vanilla wafers that are also gluten-free! Simple ingredients, minimal prep time, and perfectly crisp and sweet. The perfect snack-sized cookie to enjoy with hot drinks or add to desserts! Line a large baking sheet (or more as needed) with parchment paper. Set aside. In a medium mixing bowl, whisk or beat coconut oil until light and fluffy in texture, similar to how you could cream butter - about 30 seconds. Then add sugar and vanilla and whisk/beat for 1 minute more. Add chickpea brine and whisk vigorously or beat for 30 seconds. Then add almond milk and mix once more. It may look a little congealed, but that is okay. Keep going. Add salt, almond flour, and cornstarch and whisk/beat to combine. 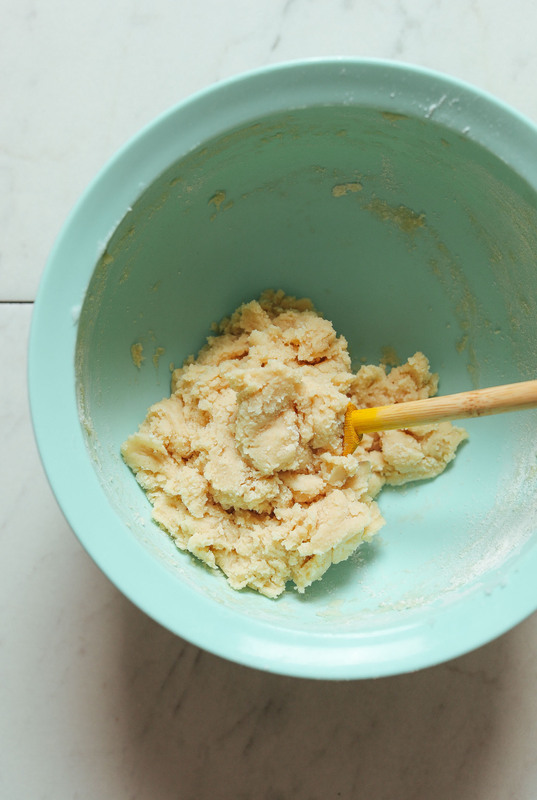 Lastly, add gluten-free flour blend and stir with a wooden spoon until a loose batter is formed. It should look like cookie batter but slightly softer. If too thin, add a mix of more almond flour and gluten-free blend until a dough consistency is reached. If too thick, add a splash of almond milk. Chill batter for 15 minutes (uncovered) while preheating oven to 350 degrees F (176 C). 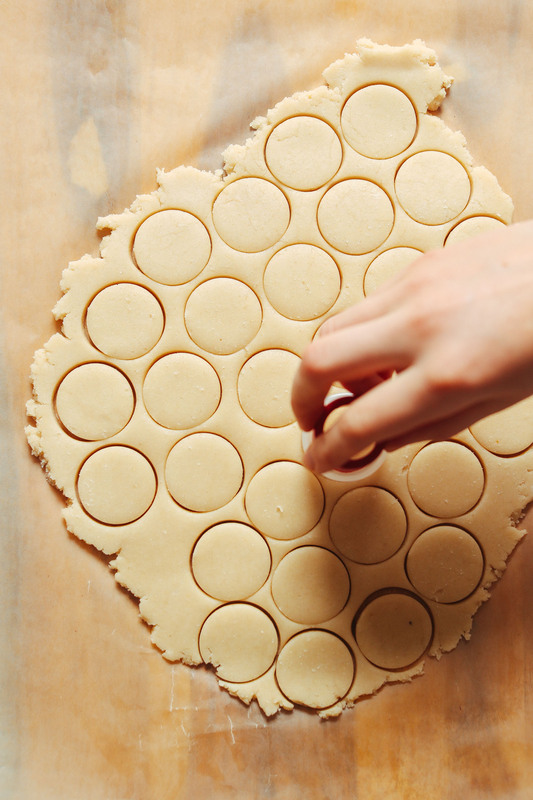 Once chilled, roll out into a 1/4-inch-thick rectangle between two pieces of wax paper and use a small circle cookie cutter to cut out cookie shapes. Reform dough as needed until it's all used up. 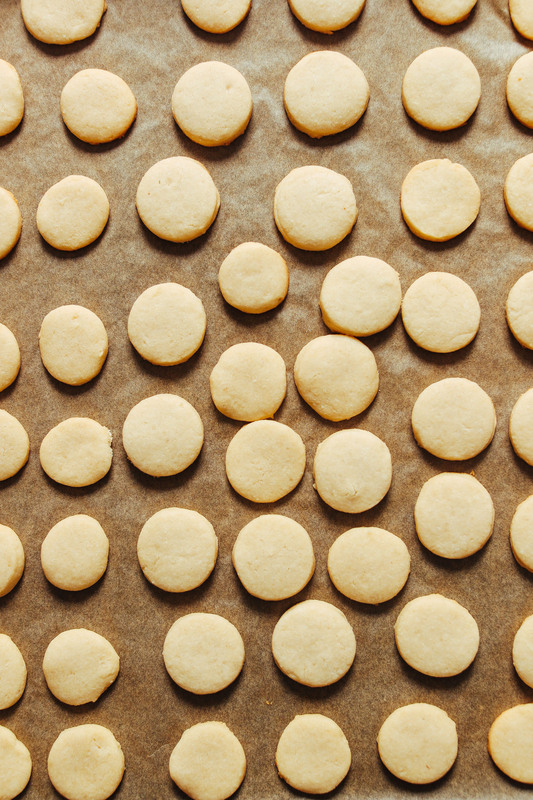 Gently transfer cookies to your parchment-lined baking sheet. They won’t spread while cooking, so they can go pretty close together. However, you may need to bake these in two batches depending on the size of your baking sheet. Bake for 15-18 minutes or until golden brown on the bottom and dry on the top. For crunchier cookies, bake longer. Just be careful not to burn. 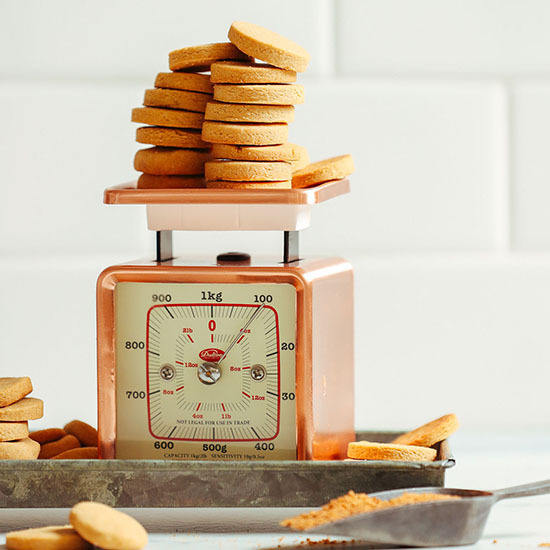 For more tender cookies, bake less. Let cool completely before removing from the pan. Store leftovers loosely covered at room temperature up to 5 days or well-sealed in the freezer up to 1 month. *If using vegan butter in this recipe, make sure it’s softened before use. And you will likely need 1-2 Tbsp less each of the cornstarch, almond flour, and gluten-free flour as the coconut oil is more wet and requires more. Lastly, know that using coconut oil makes these a little crunchier and the vegan butter makes them softer and more tender, like a sugar cookie. Both work - it just depends on which you prefer! *Using coconut flour tends to make the cookies more tender and slightly less crisp the next day after baking, which is why it wasn't our ideal but still a decent option to keep these nut-free. 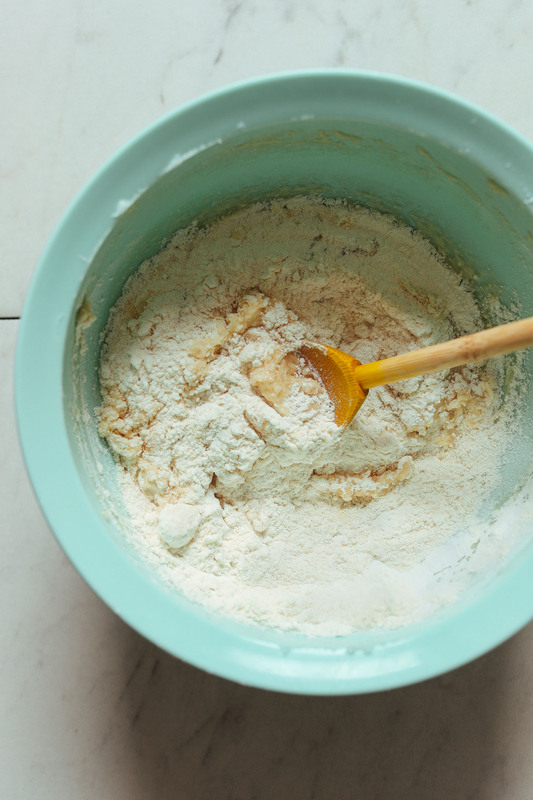 *If using coconut flour in place of almond flour, (as the original recipe is written) consider starting with 1 cup + 3 Tbsp gluten-free flour blend, as coconut flour can tend to dry out the dough a bit. 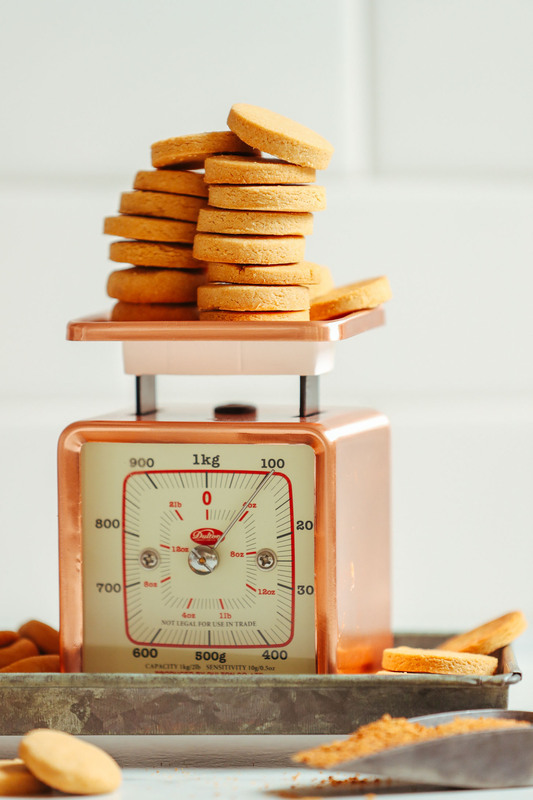 *Nutrition information is a rough estimate calculated using coconut sugar, almond flour, and cornstarch. I used Namaste gf flour versus blend recommended (soy and legume allergy). I substituted a small amount of Teff flour (2Tbsp) for the 1-1/4 cup total. I also added 1Tbsp ground blend of Hempseed, chia seed, and flaxseed. I did use medium egg also. My almond flour was clumping since I store in freezer. The coconut oil wanted to stick to bottom of mixer bowl, so I had to scrape it and remix. My resulting dough was stiff and easy to handle. I rolled dough in small balls and pressed on parchment paper with greased glass. Once baked I placed frosting inside two cookies to make a gf vanilla creme cookie for my son. I was happy with result- texture, sweetness, crispness, and flavor. I used Namaste gf flour versus blend recommended (soy and legume allergy). I substituted a small amount of Teff flour (2Tbsp) for the 1-1/4 cup total. I also added 1Tbsp ground blend of Hempseed, chia seed, and flaxseed. I did use medium egg also. My almond flour was clumping since I store in freezer. The coconut oil wanted to stick to bottom of mixer bowl, so I had to scrape it and remix. My resulting dough was stiff and easy to handle. I rolled dough in small balls and pressed on parchment paper with greased glass. Once baked I placed frosting inside two cookies to make a gf vanilla crepe cookie for my son. I was happy with result- texture, sweetness, crispness, and flavor. I can’t eat nuts, so I swapped the almond flour for oat flour and used flax milk, I did have to use a bit more milk. I also subbed 1tbls of the coconut oil for vegan butter to lower the fat. Anyhow, they turned out great! I love that they aren’t overwhelmingly sweet. The vanilla wafers look delicious. What could I use as a substitute for arrowroot or cornstarch? (I have psyllium husk) could that work? We haven’t tried psyllium husk and can’t say for sure! Potato or tapioca starch may work? If you experiment with any of these substitutions, report back on how it goes. Good luck! Can I use whole wheat flour for these? Or another non-gf flour? What could be used instead of coconut oil or any oil at all? I’m trying to eliminate oil from my diet (whole food plant based). Hi Erin! I wouldn’t recommend skipping the oil for this recipe, but you could use olive oil or vegan butter in place of coconut oil. Just wondering what I can substitute the aquafaba with, as my daughter is allergic to chickpeas. If not vegan, you could try using an egg in place of the aquafaba? Otherwise a flax egg should work as well. I made no changes to the recipe other than using a vanilla bean instead of extract because I had one, so why not? The cookies came out great. I preferred them slightly crisper and brown at the edges. I made them tonight and I think I’m going to have to make them again tomorrow. I like these better than the store bought ones by a long shot. No weird aftertaste, not too sweet and the texture with the almond flour was great! Thanks for taking the time to write this up! These cookies taste great! The dough was super oily and kind of hard to handle, but in the end not too bad. Some of them burnt just a little. My suggestion is to make them more on the thick side. I am super excited to put these together with your banana blizzard recipe!! The mixture is in the freezer as I’m typing this out! We are assembling the peanut butter banana pudding tomorrow. I used the coconut flour substitute. I flipped the cookies over during baking to help crisp them. Usually I have to make a separate banana pudding for myself without cookies do to being GF. We hope you enjoy it, Brandy! I just made these and I they turned out nice. I made them very thin and still got about 26. The ones in the photo look very thick not sure how you would get 35 from that ?. Delicious nonetheless and the recipe is a keeper. I like how they were slightly sweet and the house smelled amazing while baking. P.S. why are you guys asking to sub the aquafaba for an egg? You are in the wrong website. There are many of us who suffer multiple allergies. Dana’s website has saved our ability to not only feed our children, but make food that we can all sit down and enjoy together as a family – key to helping our children develop positive and social associations with food. Unfortunately, when a person is allergic to pea protein, nuts, soy, corn, wheat, whey, psuedo grains like millet and amaranth, or in our children’s cases – all of these – it becomes important to keep an open mind about what goes back into the diet since so much of what others take for granted is no longer an option. Thank you, Dana, for your amazing recipes and what’s more, how your website opens the world up to all kinds of people and diets, rather than narrowing them. I didn’t have ingredients to make the gf flour so I subbed all purpose flour and added to the almond flour. I took them out at about 16 minutes for a softer cookie. They turned out wonderfully! The dough was addicting. I could see adding some of the batter to some (n)ice cream. :) If being able to eat cookie batter safely isn’t reason enough to go vegan… ;) Great recipe! I was wondering the same. Can this be made without a GF flour mix? Such as Almond flour and all purpose flour? I think that should work! Let us know if you try it! I made this recipe exactly as written with my GF blend being 3/4 oat flour, 1/4 garbanzo bean flour. I wanted the cookies crispy and had to bake longer than suggested, 24 minutes, until the edges got barely golden and the cookies seemed like they would get crisp as they cooled. Blended them and used as a delicious cheesecake crust! Glad you enjoyed them, Diane! I don’t need to have gluten free so what flour can I use? Probably just unbleached all purpose or white spelt! Looks great! 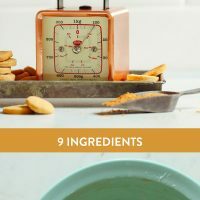 Is it possible to make this recipe without the GF flour blend? I’m trying to avoid flours like tapioca etc. Is it possible to use only the almond flour? If I were you I’d use almond flour mixed with some other gluten free (if needed) flour. Almond flour on its own can be too tender. If using your GF flour blend for this recipe – is there a substitute for potato starch and tapioca flour? I am nightshade and tapioca intolerant. Hmm, thats tough. If you can try oat flour. Otherwise, perhaps a blend of almond, arrowroot, and buckwheat? I’d recommend 1 small egg! Hi! What can replace coconut oil? Olive oil? Unfortunately, coconut oil raises my cholesterol. Olive oil should work. Either that or vegan butter. So I can use one egg instead of the chick pea brine? I am allergic to beans and pulses. Yes, I’d recommend one small egg. I’d also love to know how to sub eggs! Thanks! I agree with Barbara, most plant-based/vegan recipes you would sub 1 egg as you would with recipes that use animal by-products. To be sure you may want to compare it with another recipe that isn’t plant-based and gluten-free. I would go with one egg since the recipe calls for 3 tbsp aquafaba, you just need it to bind. What if this recipe was made with eggs…how many would it call for? probably one – let us know if you give it a try! I love ‘nilla wafers! These look fab, Dana! Coconut or rice milk for the almond milk. As for the almond flour, I’d say your best bet is subbing 1-2 Tbsp coconut flour OR just additional gluten free flour blend. Let us know if you try it! Looks Delisch! Would love to try this weekend! Have you tried it with a liquid sweetener? e.g. Maple/date syrup…I am not a big fan of coconut sugar nor stevia. I haven’t! But if you do, let us know how it goes!